I found this abaloneoyster shell on the beach the other day. I initially thought it a stone, but someone suggested it might be an abalone shell. Not being that familiar with varieties of shellfish I agreed, due to the pearlescence visible in places. Later almero suggested it might be an oyster shell, and this has been confirmed by Robbie. I’m slightly embarrased that after living at the coast for six years, it took a Vrystaat boykie to identify this. Thanks. No, I’m not sure that it is an abalone shell and just took the photo without looking under the shell. It may be an oyster shell. When I first saw and photographed it, I thought it was a stone and labelled it as such when I first put it on Flickr. Someone commented, saying it wasn’t a stone but an abalone shell. Looking at it again I agreed that it looked more like a shell than a stone, but it may not be abalone. 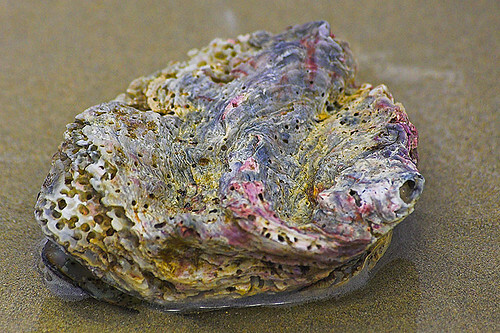 That is an Oyster shell, Abalone have only one shell, this one has two. Big old oyster it was too judging by the size of the sand grains compared to the shell.